Balearic Health Service — IB-Salut, Son Serra-La Vileta Health Care Centre; Instituto de Investigación Sanitaria de Palma, Palma, Spain. Valencian Health Service — Conselleria de Sanitat Universal i Salut Pública, Paterna Health Care Centre, Valencia, Spain. Catalunya Health Services — Institut Català de la Salut; DAP Camp de Tarragona, Catalunya, Spain. Balearic Health Service — IB-Salut, Manacor Health Care Centre, Manacor, Spain. Balearic Health Service — IB-Salut, Son Serra-La Vileta Health Care Centre, Palma, Spain. Valencian Health Service — Conselleria de Sanitat Universal i Salut Pública, La Ribera Hospital, Valencia, Spain. Catalunya Health Services — Institut Català de la Salut; Falset Health Care Centre, Catalunya, Spain. Catalunya Health Services — Institut Català de la Salut; Constantí Health Care Centre; Catalunya, Spain. Catalunya Health Services — Institut Català de la Salut; Reus Health Care Centre, Catalunya, Spain. Primary Care Research Unit of Mallorca, Baleares Health Services — IB-Salut, Palma; Instituto de Investigación Sanitaria de Palma, Spain. Background Primary care interventions that promote cessation of benzodiazepine (BZD) use in long-term users are effective at 1 year, but their efficacy at 3 years is uncertain. Aim To assess the 3-year efficacy of two primary care interventions delivered by GPs on cessation of BZD use in long-term users. Design and setting Multicentre, three-arm, cluster randomised, controlled trial, with random allocation at the GP level. 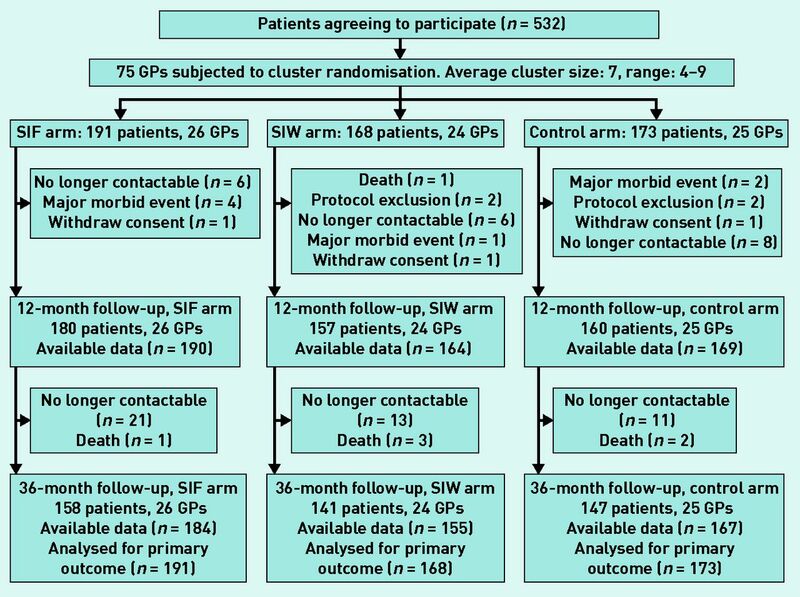 Method Seventy-five GPs and 532 patients were randomly allocated to three groups: usual care (control), structured intervention with stepped-dose reduction and follow-up visits (SIF), or structured intervention with written stepped-dose reduction (SIW). The primary outcome was BZD use at 36 months. Results At 36 months, 66/168 patients (39.2%) in the SIW group, 79/191 patients (41.3%) in the SIF group, and 45/173 patients (26.0%) in the control group had discontinued BZD use. The relative risks (RR) adjusted by cluster were 1.51 (95% CI = 1.10 to 2.05; P = 0.009) in the SIW group and 1.59 (95% CI = 1.15 to 2.19; P = 0.005) in the SIF group. A total of 131/188 patients (69.7%) who successfully discontinued BZD use at 12 months remained abstinent at 36 months. The groups showed no significant differences in anxiety, depression, or sleep dissatisfaction at 36 months. Conclusion The interventions were effective on cessation of BZD use; most patients who discontinued at 12 months remained abstinent at 3 years. Discontinuation of BZD use did not have a significant effect on anxiety, depression, or sleep quality. Clinicians mainly prescribe benzodiazepines (BZDs) to treat anxiety and insomnia, or as adjuvants in treatment of depression. Long-term BZD use is widespread in Spain1,2 and many European countries,3 although international guidelines specifically recommend short-term use4 because long-term use can increase the risk of cognitive impairment,5,6 falls, fractures,7 and mortality.8–10 Despite these potentially harmful consequences, many physicians prescribe BZDs for long durations. GPs issue most of these prescriptions,11,12 so withdrawal also should be managed in this setting; however, doctors and patients often consider BZD discontinuation as very challenging. Previous studies have evaluated different approaches to discontinuation.13 These include simple interventions, such as a letter with advice about how to stop BZD use14,15 and a brief interview with a GP followed by stepped-dose reduction,11,16–18 and more complex interventions that provide psychological19–21 or pharmacological22 support. GPs typically have busy schedules and limited time for consultation, so interventions designed for this setting should be inexpensive, brief, and easily implemented. Evidence supports the efficacy of certain short-term interventions (6–12 months) for cessation of BZDs in long-term users in the primary care setting.11,13,14,16–18 However, there is limited evidence about the long-term efficacy of these interventions. A previous clinical trial of BZD discontinuation23 indicated that a structured intervention with follow-up visits (SIF) or structured intervention with written instructions (SIW) led to significant reductions in long-term benzodiazepine use at 12 months. The interventions were three times more effective than usual care, with an absolute reduction in long-term consumption of 30%. The present study aimed to assess the efficacy of this intervention at 36 months. Long-term use of benzodiazepines is common even though prescription guidelines recommend limiting benzodiazepine treatment to only a few weeks. Strategies employed by GPs for discontinuation of benzodiazepines are effective in the short term, but there is limited evidence about their long-term efficacy. This study shows that two primary care interventions for discontinuationof benzodiazepines in long-term users remained effective after 3 years, at which time patients experienced no changes in anxiety, depression, and sleep quality. Patients were recruited between November 2010 and February 2011. Results are presented of the 36-month assessments carried out between November 2013 and February 2014. The study design, procedures, and reporting followed the CONSORT guidelines for cluster randomised controlled trials25 (Trial Registration: ISRCTN13024375). Patients aged 18–80 years who had been taking BZDs daily for at least 6 months were randomly selected from the computerised prescription databases of primary care physicians. GPs were asked to include eight patients from their list of patients. The exclusion criteria were patients with: psychotic disorder, severe personality disorder, alcohol or illicit-drug abuse, anxiety or depressive disorder and currently being treated by a psychiatrist, severe medical or terminal illness, or currently hospitalised. Patients were also excluded if the GP believed that cessation of BZD use may be harmful and if they were unable to read and speak Spanish. Each region enrolled 25–30 GPs. After they had been selected and patients included in the trial, GPs in each of the three regions were randomised 1:1:1 to one of the three study arms using a computer-generated block randomisation in blocks of six GPs. Randomisation and concealment were centralised through a single coordinating centre, and the sequence was concealed from patients and GPs until interventions were assigned. After the GPs were randomised, those allocated to the intervention arms attended a 2-hour workshop on BZD discontinuation. The SIF and SIW were based on an initial structured educational interview with individualised stepped-dose reduction. Patients allocated to the SIF group were scheduled for follow-up appointments with their GPs every 2–3 weeks until the end of the dose reduction period; patients allocated to the SIW group received written instructions with reinforcing information and a tailored gradual dose-reduction until cessation. a self-help leaflet to improve sleep quality if patients were taking BZDs for insomnia. The tailored gradual taper consisted of a 10–25% reduction in the daily dose every 2–3 weeks. GPs were allowed to switch from use of a BZD with a short half-life to a BZD with a long half-life. Patients allocated to the control group were given routine care, and GPs did not receive any specific recommendation about the management of these long-term BZD users. The primary endpoint was BZD cessation, defined as no prescription in the last 6 months. A single prescription for <30 doses during the whole 6-month period was also considered successful. The outcome was assessed by prescription claims in the clinical records, and evaluated by collaborating researchers who were blinded to patient allocations. The statistician and data-entry staff were also blinded to allocations. The secondary outcomes were the presence of anxiety, depression, and sleep satisfaction. Anxiety and depression were measured using the Hospital Anxiety and Depression Scale (HADS), a 14-item, 4-point Likert-type scale with a range of 0 (no symptoms) to 3 (severe symptoms) for each item. This scale was validated for general hospital patients and patients in primary care, and cross-culturally validated for the Spanish language.26 Sleep satisfaction was assessed through the Oviedo Sleep Quality Questionnaire satisfaction subscale27 (Oviedo), a 7-point Likert-type scale that ranged from 1 (not satisfied) to 7 (very satisfied). Research collaborators not involved in the study and unaware of patient allocation evaluated the secondary outcomes by telephone interview. BZD discontinuation at 36 months was analysed at the patient level on an intention-to-treat basis with adjustment for data clustering. The sample size was based on the effectiveness at 12 months to detect a difference in the proportion of patients who had discontinued BZD of at least 20% and 15% in the SIF and SIW groups, respectively. Using an intracluster correlation of 0.0428 to allow for clustering, a cluster size of eight, and 25% patients assumed lost to followup, the aim was to recruit 495 patients and 63 GPs. The estimated relative risk (RR) of patients in each group was adjusted for cluster by use of a log link in a binomial distribution of a robust generalised estimating equation (GEE) and an exchangeable correlation structure. The absolute risk reduction (ARR) and number needed to treat (NNT) were calculated from the estimated RR. Categorical variables are reported as numbers and percentages. A between-group analysis of HAD scores and sleep satisfaction (using the Oviedo Sleep Quality Questionnaire) was performed using Somers’ D rank statistics. Within-group analysis was carried out by a paired-sample Somers’ D rank test. Median differences between groups and within groups were calculated and reported by the Hodges–Lehmann and von Mises estimators for clustering data, respectively. Statistical significance was set at 5%. Stata (version 11.0) was used for all analyses. There were 532 patients initially enrolled in the trial (Figure 1). Thirty-five patients (6.6%) were lost at 12 months (11 in the SIF group, 11 in the SIW group, and 13 in the control group) and 86 patients (16.2%) were lost at 36 months (33 in the SIF group, 27 in the SIW group, and 26 in the control group). The primary outcome was based on prescription claims in the clinical records, however, so data on BZD use were available for 506 (95.1%) patients, with 26 lost to follow-up (six in the control group, seven in the SIF group, and 13 in the SIW group). Flow of patients and GPs through the study. SIF = intervention group with follow-up visits. SIW = intervention group with written instructions. The median age of participants was 64 years and 72% were female (Table 1). The three groups showed no significant differences in any of the recorded baseline characteristics. The main reasons for initial BZD prescription were insomnia (68.8%), anxiety (65.2%), and depression (29.5%), and the median treatment duration was 60 months. Most prescriptions (73%) were issued by GPs and 85% of patients were taking a BZD with a short half-life. Table 2 shows the efficacy of the treatments. At 36 months, 66/168 patients (39.2%) in the SIW group and 79/191 patients (41.3%) in the SIF group had discontinued BZD use, but only 45/173 patients (26.0%) in the control group had discontinued BZD use. The RR adjusted by cluster was 1.51 (95% CI = 1.10 to 2.05; P = 0.009) for the SIW group and 1.59 (95% CI = 1.15 to 2.19; P = 0.005) for the SIF group; there were no significant differences between the SIF and SIW groups. Relative to the control group, the ARR was 13.2% for the SIW group and 15.3% for the SIF group. The NNT to achieve one patient withdrawal from BZD use at 36 months was seven (95% CI = 4 to 26) in the SIW group and six (95% CI = 4 to 16) in the SIF group. Two-thirds (69.7%) of patients who were withdrawn at 12 months remained BZD-free at 36 months. Moreover, 17% of patients discontinued between the 12- and 36-month evaluations (Table 3). Tables 4 and 5 show the secondary outcomes. A between-group analysis at 36 months indicated that the three groups had no significant differences in HADS anxiety score, HADS depression score, and sleep satisfaction. However, within-group analysis indicated a significantly lower HADS anxiety score in the SIF group at 36 months relative to baseline. The main finding of this study of different treatments on BZD cessation in long-term users is that the SIW and SIF interventions, accompanied by a tailored stepped-dose reduction, are up to 1.5 times more effective than routine care in discontinuing long-term benzodiazepine use. Both interventions have similar efficacy but the approach without follow-up visits required less involvement and fewer visits to the GP. The NNT analysis indicates that a GP needs to treat six patients (SIF) or seven patients (SIW) for one patient to discontinue BZD use at 36 months. The RR and the ARR for the SIF and SIW are halved with respect to the 12-month evaluation.23 Approximately 70% of the patients who stopped BZD use at 12 months remained abstinent at 36 months; among those still taking BZD at 12 months, about 17% had stopped use at 36 months. The interventions used in the present study can be considered safe as they did not increase anxiety, depression, or sleep dissatisfaction compared with the control group at 12 and 36 months. Moreover, discontinuing long-term BZD use did not worsen anxious or depressive symptoms or sleep satisfaction. Patients improved in all three of these measures at 3 years after the intervention, although the reduction in anxiety was only statistically significant for the SIF group. The present study is the largest randomised clinical trial to evaluate the 3-year efficacy of interventions designed to promote cessation of BZD use in long-term users. The study had a high internal validity and the sample size was large enough to detect small differences between the groups. Moreover, patients were included before randomisation, and few patients were lost to follow-up, thus limiting the effect of selection bias. Previous studies have used different definitions for cessation of BZD use. Some studies considered a patient to be withdrawn if there were no prescriptions at all; in the present study, a patient was considered to be withdrawn if there were no prescriptions or a prescription of fewer than 30 doses in the last 6 months. Thirty doses were chosen because most drug packages in Spain include 30 pills. Moreover, in the present study the primary outcome was assessed by prescription claims data, a more reliable measure of consumption than self-reported data from interviews. This study excluded patients with severe comorbidities, and this limits the generalisability of results to more-difficult-to-treat patients, such as those with severe medical or psychiatric disease and those under psychiatric care. GPs in the control group applied ‘usual care’ to their patients. ‘Usual care’, however, has different meanings to different GPs and in different health systems. This may also affect the generalisability of the results regarding the efficacy of the interventions. Previous studies have evaluated the efficacy of non-pharmacological interventions for long-term discontinuation of BZD use.29–33 Some of these studies, however, lacked control groups, some only followed patients who stopped use after 3, 6, or 12 months,30–32 and some had control groups composed of patients who simply refused to participate in the intervention programmes.33 To the authors’ knowledge only one previous long-term clinical trial on cessation of BZD used a randomised control group.29 The efficacy of a structured intervention with follow-up visits at 36 months was similar in that previous study, which also showed decreased efficacy of the intervention over the long term. The percentage of patients who remained abstinent from 12 to 36 months was slightly higher in the present study than in previous studies. The abstinence rates in these other studies ranged from 49% (minimal intervention with a discontinuation letter)30 to 69.2% (supervised medication tapering programme).32 De Gier and colleagues31 conducted a 10-year follow-up study of patients who had discontinued BZDs after receiving a letter promoting cessation. They reported that 59% of patients were completely abstinent at 10 years after the intervention, and up to 73% were abstinent or had minimal use of BZDs (five or fewer doses per month during the previous 6 months). BZDs are mainly prescribed for treatment of anxiety, insomnia, and depression, and the presence of stressors can change over time. Thus, relapse of BZD use may be considered a treatment option when a patient experiences severe anxiety or insomnia in the context of stressful life events. Qualitative studies of GPs34 highlight that decisions regarding prescription of BZDs in primary care are complex, and that GPs are often uncomfortable in making these decisions because of their time constraints, high workload, and lack of accessibility to non-pharmacological options. GPs are increasingly aware of the risks of BZDs, however. A more patient-centred practice in which a GP listens to a patient’s expectations and empathetically provides explanations about the benefits and drawbacks of treatment may help them in their decisions to initiate, continue, or withdraw BZD prescriptions. In conclusion, SIW and SIF interventions are effective for helping patients to stop using BZDs, and are not associated with increases in anxiety, depression, or sleep dissatisfaction in the long term. GPs can apply these interventions in their practices easily for patients without severe comorbidities, and may choose either intervention according to the needs of the patient and physician. Thus, more busy practices may choose an intervention without follow-up visits, which is as effective as the intervention with follow-up visits but less time consuming. Alternatively, other GPs may choose to offer a more intensive approach with follow-up visits for patients with a higher disease burden or with more severe BZD dependence. A large number of patients take BZD on a long-term basis, and there is growing evidence of the negative effects of long-term use. Thus, future research should assess the efficacy of the systematic implementation of these interventions by different GPs and evaluate the potential impact of different training strategies for reduction of long-term BZD consumption. We would like to thank Joan Llobera, Magdalena Esteva, Margalida Gili, Miquel Roca, Enric Aragones, and Jose Luis Beltran for their insightful contributions to this article. We would like to thank the participating GPs (BENZORED group) for patient recruitment, collection of data, and implementation of the interventions, and the participating patients for having confidence in their GPs. This BENZORED study was funded by the Carlos III Health Institute of the Ministry of Economy and Competitiveness (Grant No. PS09/00947) and the Network for Prevention and Health Promotion in Primary Care (redIAPP, RD12/0005) co-financed with European Union ERDF funds. The Ministry of Economy and Competitiveness had no role in the design and conduct of the study, collection, management, analysis, and interpretation of the data, the preparation, review, and approval of the manuscript, or in the decision to submit the manuscript for publication. This research was conducted independently from the funding body. The study protocol was approved by the Primary Care Research Committee and the Balearic Ethical Committee of Research (IB 1146/09 PI). The authors declare support from the Carlos III Health Institute, Ministry of Economy and Competitiveness. Revision requested September 8, 2015. (2014) Utilización de medicamentos ansiolíticos e hipnóticos en España durante el período 2000–2012, (Spanish Agency of Medicines and Health Devices [AEMPS}. Trends in use of anxiolytics and hypnotics in Spain from 2000 to 2012. Observatory of drug utilization), http://www.aemps.gob.es/medicamentosUsoHumano/observatorio/docs/ansioliticos_hipnoticos-2000-2012.pdf (accessed 16 Dec 2015). (2008) Increased benzodiazepine use in elderly women attending urban primary health care centers. Aten Primaria 40(12):617–621. (2002) Use of psychotropic medication in the general population of France, Germany, Italy, and the United Kingdom. J Clin Psychiatry 63(9):817–825. (2012) British National Formulary (British Medical Association and Royal Pharmaceutical Society of Great Britain, London), 64th edn. (2012) Benzodiazepine use and risk of dementia: prospective population based study. BMJ 345:e6231. (2014) Benzodiazepine use and risk of Alzheimer’s disease: case-control study. BMJ 349:g5205. (2012) Potential impact of benzodiazepine use on the rate of hip fractures in five large European countries and the United States. Calcif Tissue Int 91(1):24–31. (2010) Mortality hazard associated with anxiolytic and hypnotic drug use in the National Population Health Survey. Can J Psychiatry 55(9):558–567. (2012) Hypnotics’ association with mortality or cancer: a matched cohort study. BMJ Open 2:e000850. (2014) Effect of anxiolytic and hypnotic drug prescriptions on mortality hazards: retrospective cohort study. BMJ 348:g1996. (2006) Withdrawal from long-term benzodiazepine use: randomized trial in family practice. Br J Gen Pract 56(533):958–963. (2009) Withdrawing benzodiazepines in primary care. CNS Drugs 23(1):19–34. (2006) Strategies for discontinuing long-term benzodiazepine use: meta-analysis. Br J Psychiatry 189:213–220. (2005) Discontinuation of long-term benzodiazepine use by sending a letter to users in family practice: a prospective controlled intervention study. Drug Alcohol Depend 78(1):49–56. (2009) Implementation of a discontinuation letter to reduce long-term benzodiazepine use — a cluster randomized trial. Drug Alcohol Depend 99(1–3):105–114. (1994) Evaluation of an easy, cost-effective strategy for cutting benzodiazepine use in general practice. Br J Gen Pract 44(378):5–8. (1994) Controlled evaluation of brief intervention by general practitioners to reduce chronic use of benzodiazepines. Br J Gen Pract 44(386):408–412. (2004) Randomised controlled trial of two brief interventions against long-term benzodiazepine use: outcome of intervention. Addict Res Theory 12(2):141–154. (2003) Tapering off long-term benzodiazepine use with or without group cognitive-behavioural therapy: three-condition, randomized controlled trial. Br J Psychiatry 182:498–504. (2003) Discontinuation of benzodiazepines among older insomniac adults treated with cognitive-behavioural therapy combined with gradual tapering: a randomized trial. CMAJ 169(10):1015–1020. (2004) Randomized clinical trial of supervised tapering and cognitive behavior therapy to facilitate benzodiazepine discontinuation in older adults with chronic insomnia. Am J Psychiatry 161(2):332–342. (2006) Pharmacological interventions for benzodiazepine mono-dependence management in outpatient settings. Cochrane Database Syst Rev (3):CD005194. (2014) Comparative efficacy of two interventions to discontinue long-term benzodiazepine use: a cluster randomized controlled trial in primary care. Br J Psychiatry doi:10.1192/bjp.bp.113.134650. (2011) Comparative efficacy of two primary care interventions to assist withdrawal from long term benzodiazepine use: a protocol for a clustered, randomized clinical trial. BMC Fam Pract 12:23. (2012) Consort 2010 statement: extension to cluster randomized trials. BMJ 345:e5661. (2003) Evaluation of the psychometric characteristics of the Spanish version of the Hospital Anxiety and Depression Scale. Acta Psychiatr Scand 107(3):216–221. (2000) Propiedades psicométricas del cuestionario Oviedo de sueño. Psicothema 12:107–112. (2000) Sample size calculations for cluster randomised trials. Changing Professional Practice in Europe Group (EU BIOMED II Concerted Action). J Health Serv Res Policy 5(1):12–16. (2008) Long-term effectiveness of an intervention to discontinue chronic benzodiazepine use. Actas Esp Psiquiatr 36(5):295–298. (2003) Predictors of relapse after discontinuation of long-term benzodiazepine use by minimal intervention: a 2-year follow-up study. Fam Pract 20(4):370–372. (2011) Discontinuation of long-term benzodiazepine use: 10-year follow-up. Fam Pract 28(3):253–259. (2005) Long-term outcome after discontinuation of benzodiazepines for insomnia: a survival analysis of relapse. Behav Res Ther 43(1):1–14. (1991) Long-term benzodiazepine users 3 years after participation in a discontinuation program. Am J Psychiatry 148(6):757–761. (2013) General practitioners’ experiences and perceptions of benzodiazepine prescribing: systematic review and meta-synthesis. BMC Fam Pract 14:191.